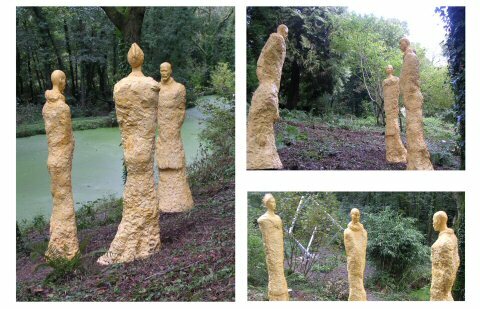 Artists of the Silk Road - trio Created in May 2006 in China, these three monumental statues (average height 3m 50) were shipped to Canterbury in Kent, and are currently located at Broomhill Sculpture Park in Devon. They are available for purchase via this website or through Broomhill. - Monumental "Artists of the Silk Road Trio" in the making. See pictures of the monumental Artists of the Silk Road being made by clicking here. Also on that page, see pics of these monumental statues in MFA degree show at University College of the Creative Arts in Canterbury (Kent, England).